Summary: A simple model of a DC motor is presented. 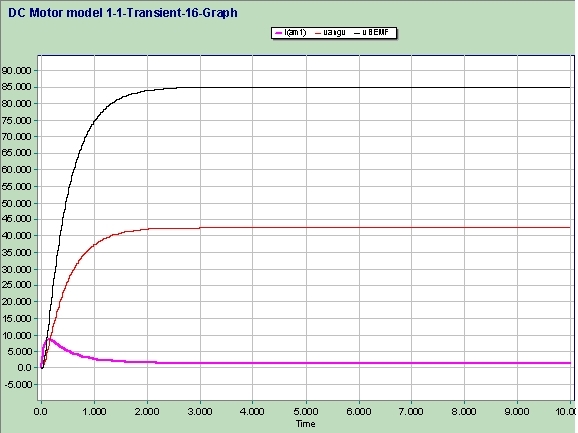 This model is intended to be used in conjunction with the motor torque equation (MTE) block previously developed. It is NOT intended to be used with the generalized mechanical rotational and translational devices previously and to be developed, however. The reason this is so is that the MTE block uses voltages as inputs to represent the motor and load torque quantities, whereas in the generalized mechanical blocks, we use devices that are represented using a current-force analogy. DC Motor 2 will represent this same motor, but as a device, which can be used with other mechanical translation and rotation models as appropriate. This model is that of a simple DC motor. It is what I would describe as a macro model, or a behavioral model, in that it does not attempt to represent internal details of motor operation within a rotational cycle, but produces an average output over a rotational cycle of motor behavior. Consequently, such details as the effect of brushes, and detailed representations of the effects of rotation are 'averaged out' to present an external terminal model of the motor. The model above has the following familiar elements. Lm - the motor winding inductance in henries, Rm - the motor winding resistance in ohms. 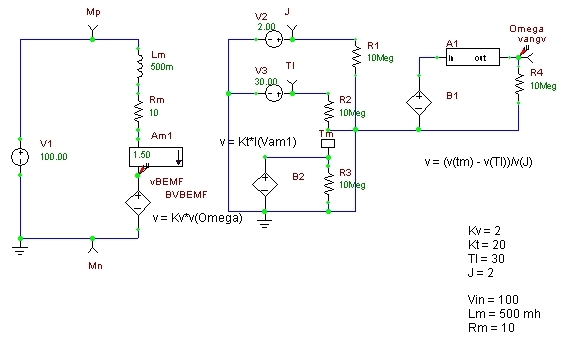 The BVBEMF generator creates a voltage which opposes the applied voltage, and which is directly proportional to the rotor angular velocity, which in most cases is the shaft angular velocity - and is so assumed here. Am1 is really a zero volt generator, used to determine the winding current. Examination of the circuitry shows that arbitrary nonlinear source B1 produces a voltage which is the argument of the above integral expression, and integrator device A1 performs the integration to produce a value for w. Now of course the Tl and the J inputs are also voltages. The motor torque is equated to Kt*Ia, where Kt is the motor torque constant, and Ia, really ia(t) is the motor current. The back EMF is created by arbitrary nonlinear voltage BVBEMF as the product of the angular velocity and Kv, a motor voltage constant. Note that in the model there is no ground for the primary motor winding. 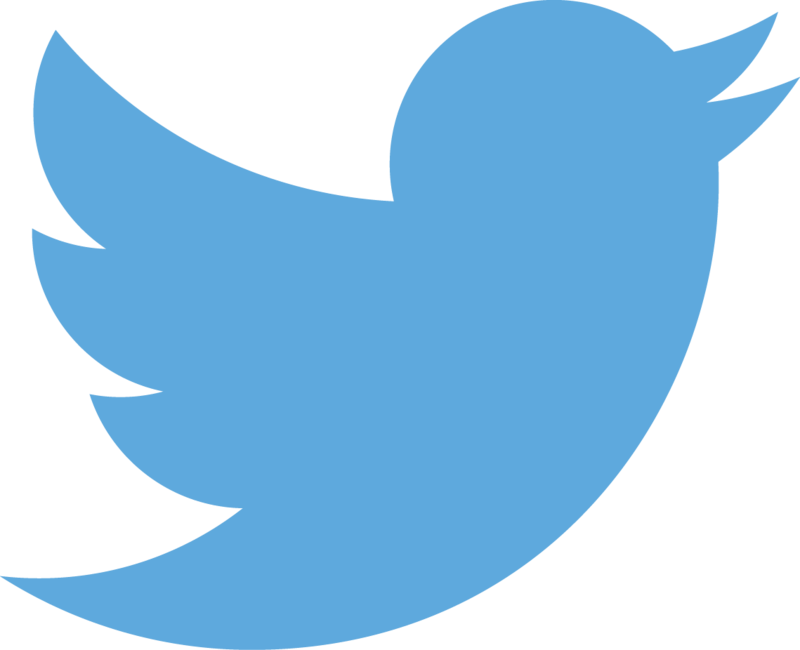 It left floating for generality, and it assumes that the external circuitry will provide the necessary connection to ground. The question may arise concerning what the units are for the Tl and J inputs and angular velocity w. Rather than rehash the discussions of units regarding force and mass, you may wish to review the document in Reference 2, which has a section on units. And although the equations WILL work with a set of consistent english units, for the remainder of this document we will concern ourselves only with metric units. A graph of this circuit showing the BEMF voltage, motor current and angular velocity is shown in Figure 3 following. Here we can see that the motor current rises rapidly (violet, lowest trace) until the BEMF voltage becomes appreciable and decreases the motor current. The middle red trace is the motor angular velocity, and it stabilizes at about 42.5 radians/sec. The top trace is the BEMF voltage, and we can see it reaches 85 volts. Looking at the motor equation, when the dw/dt term is zero, the motor torque equals the load torque. With a load torque value of 30 newton-meters, and a Kt value of 20 newton-meters/amp, the motor current must be 1.5A. Now with a 10 ohms winding resistance, this causes 15 volts to be dropped across the winding resistance. 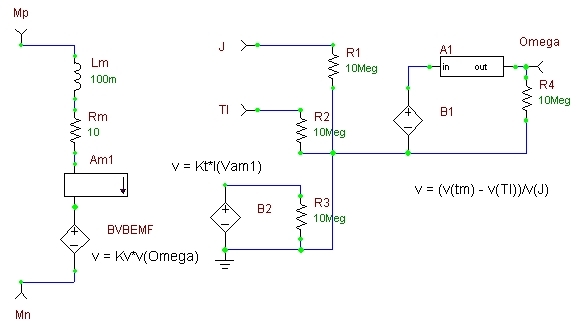 As the inductor drops no voltage when steady state occurs, the remaining 100 - 15 or 85 volts must be provided by the BEMF. The Kv constant is 2 volts per radian/sec of shaft velocity, resulting in the shaft velocity being 85/2 = 42.5 radians/sec shaft angular velocity. Everything checks. Now we could provide fan type loads which increase at some power of w, step loads, and other factors into the model, but that is left as an exercise for the reader. The only remaining task is to create a parameterized subcircuit of this model. The values of Lm, Rm, Kv and Kt should be passed to the model. Inputs are the motor voltage, and outputs are the motor velocity. Using the w output, it can be integrated to produce an angle. This angle can then be passed through a modulo converter circuit (such as the one that will be presented in a Resource section article of mine shortly). A DC motor model has been provided which could be of some use in servo system modeling. The model allows nonlinear values of load torque and inertia to be used in simulations.